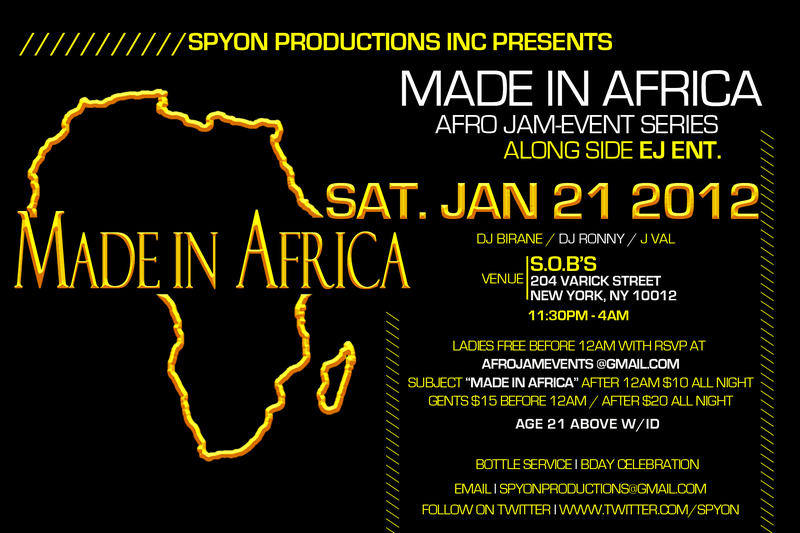 Made In Africa : An Afro Jam event series debuting on January 21 2012 at the most populous world music venue in New York City, S.O.B’s( Sounds Of Brazil). 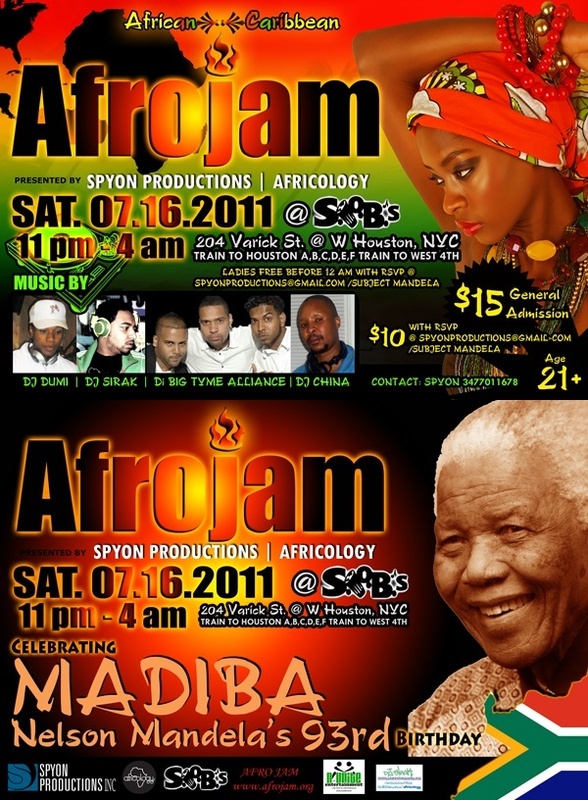 New York, NY – January 21, 2012 11:30pm-4am –AFRO JAM a subsidiary of SPYON PRODUCTIONS -A multimedia and Entertainment company that redifines classy and high-end events Proudley presents Made In Africa 1. A night of great music,featuring incredible Djs from the continent of Africa and around the world. “It is an international event. come, mix and mingle with friends and new faces from all works of life. You never know who you might run into at our events while enjoying yourself” said Spyon Productions C.E.O Vincent Nwachukwu. ” We hope this becomes a great tradition” said Ej. C.E.O of EJ entertainment an affiliate company. DRESS CODE: NO SNEAKER, NO BAGGY JEANS, NO T-SHIRT, NO BASE CAP. Afro Jam brings delivers diverse international selections such as: CALYPSO, SAMBA, CONSCIOUS REGGAE, R & B, HIP-HOP, AFRO BEATS, AFRO JAZZ, AFRO POP, MAKOSSA, MAPUKA, SOUKOUS, NDOMBOLO, HIPLIFE, COUPE-DECALE, KWAITO, ETHIO, COLAZOUK and ZOUK. This event is designed for the Classy, Sophisticated, Cultured, Stylish, most eligible individuals, couples and trend setters. If you are looking for refined sophistication, then this is for you. This is a diverse event, so come ONE..come ALL. The only thing required is your love and appreciation for culture and music.